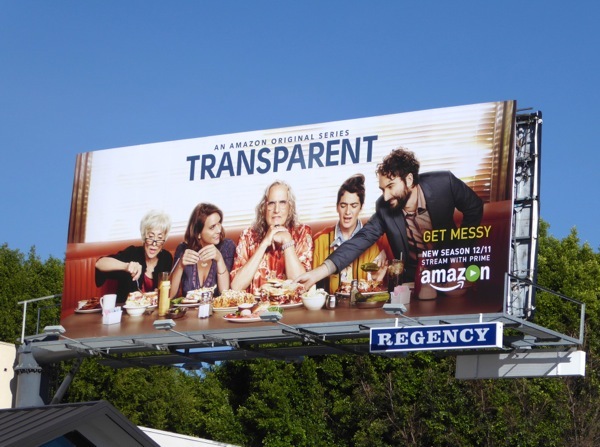 If there was one new show that seemed to win TV audiences and critics alike over last year it was Amazon's original series, Transparent. Not only did Transparent win two Golden Globes, five Primetime Emmys and more industry accolades, but it was also recognised by the LGBT community for its authentic and awareness-raising portrayal of a transgender father accepting his true self, identifying as a woman, and opening up to his L.A. family later in life. 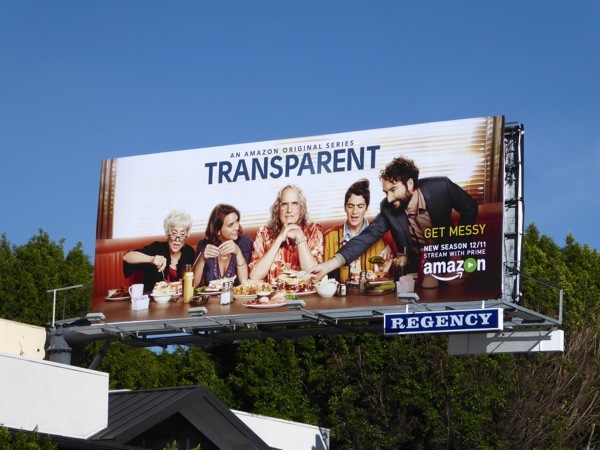 Now Jeffrey Tambor is back for a sophomore season as 'Maura Pfefferman' along with his ex-wife (Judith Light) and his three mixed up kids (Amy Landecker, Gaby Hoffmann and Jay Duplass), each with their own personal problems and relationship issues. 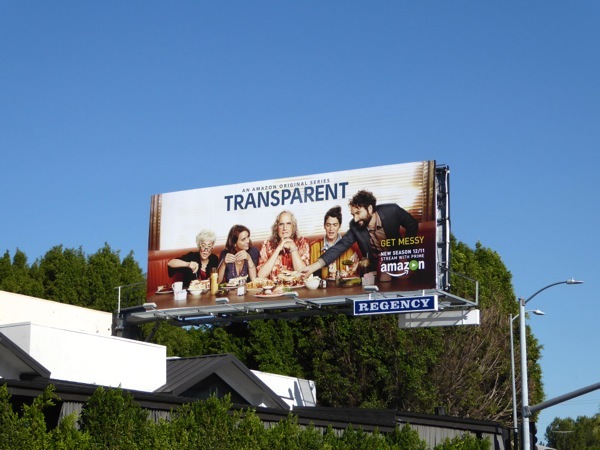 This season two diner-themed billboard for Transparent was snapped along Sunset Boulevard in West Hollywood on November 17, 2015. 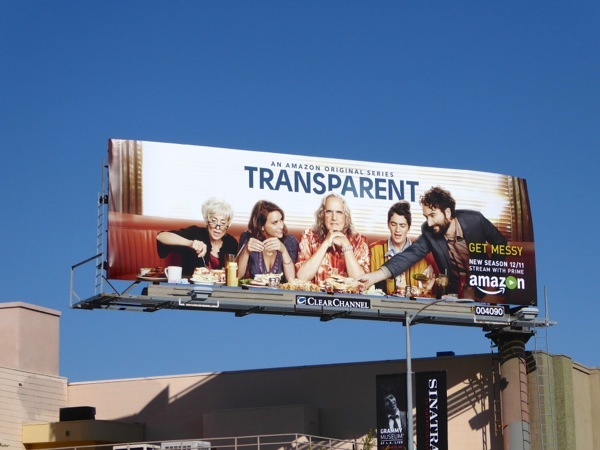 If you're a fan of the groundbreaking comedy-drama, which provided Amazon's first major award win and was the first streaming service to win the Golden Globe for Best Series, be sure to also enjoy all these season one billboards for Transparent. Let's hope the binge-worthy show can retain the quality of storytelling for its second season and continue to be an award-winning series. 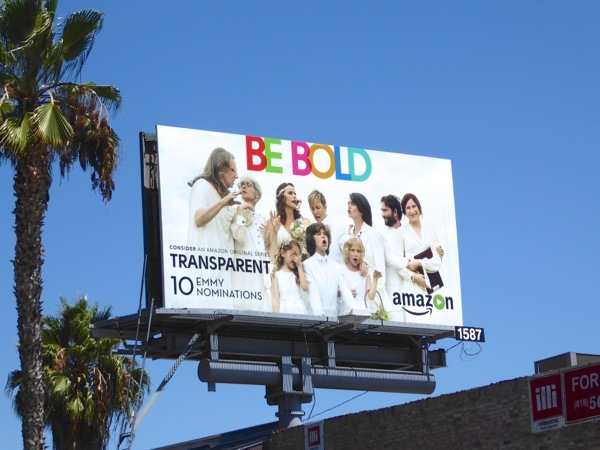 UPDATED: Here's another billboard for the series snapped along Santa Monica Boulevard over in West L.A. on November 29, 2015. 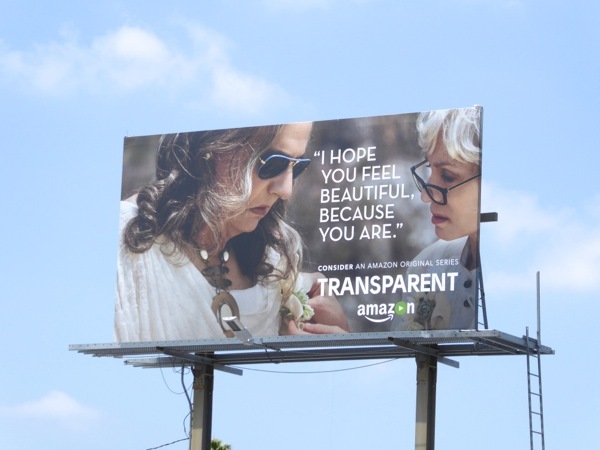 UPDATED: The second season of Transparent continued to prove that Maura has the most self-centered family in the world and she's the most normal of them all (and she's not without her issues). 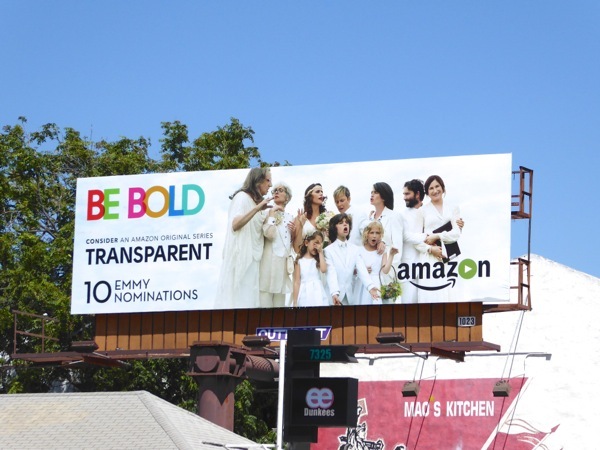 There was more than enough dramatic fodder for the groundbreaking Amazon series to be considered for more Emmys and these awards campaigning billboards were snapped along the Sunset Strip, Melrose Avenue and La Cienega Boulevard on May 26, 2016. The giant-sized 'I'm a big girl' ad creative is especially powerful, and these ads visibility even more necessary in these days of transphobic bathroom battles and continued inequality for the transgender community. 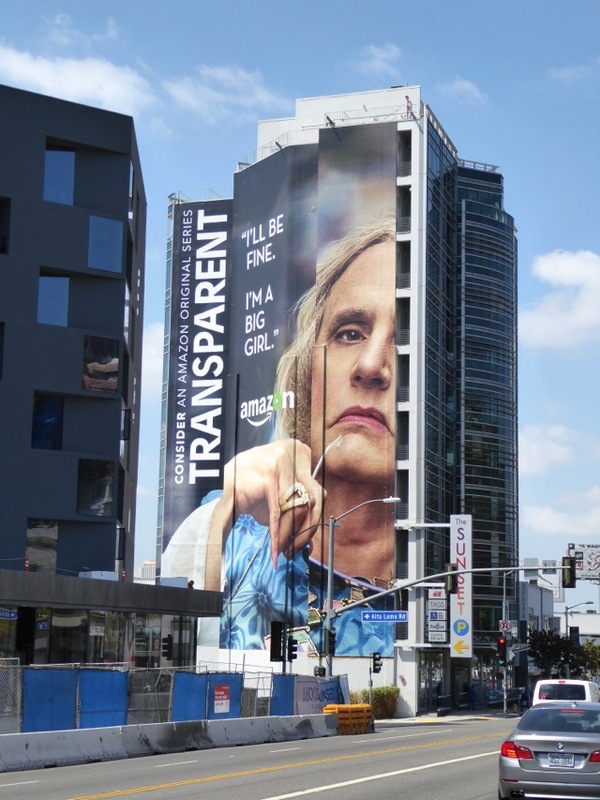 UPDATED: Congratulations to Transparent for its ten Emmy award nominations for its sophomore season. 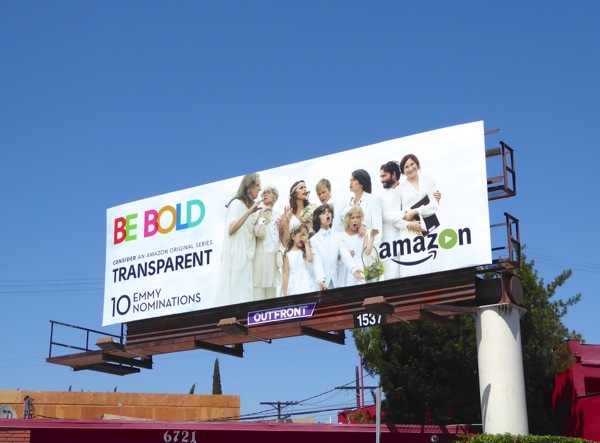 This 'Be Bold' ad creative perfectly captures the chaotic wedding photo scene of the opening season two episode and these billboards were photographed in multiple locations along Melrose Avenue on August 11, 2016. 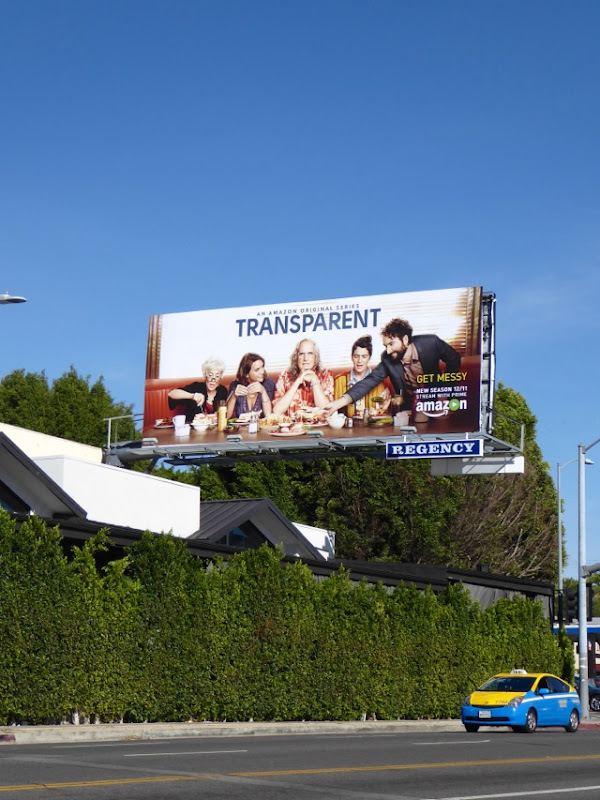 Plus here's a smaller version of the Emmy nominations ad spied along the Sunset Strip on August 15, 2016. 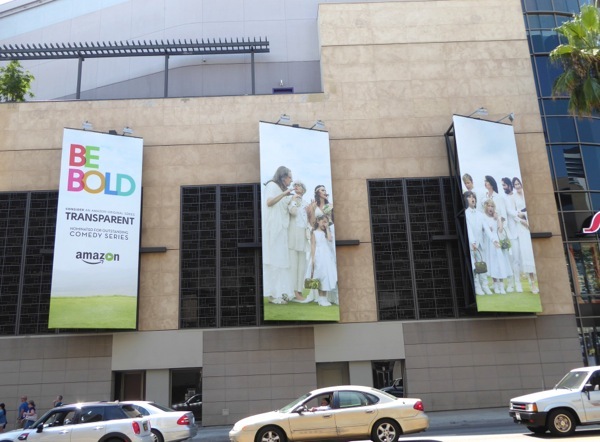 And another trio of billboard panels for the same creative at Hollywood & Highland on August 23, 2016.